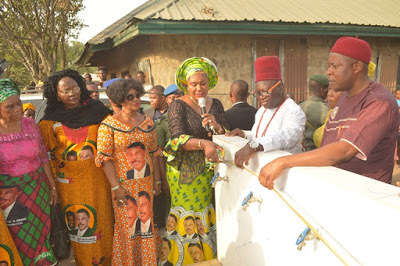 It was a mini carnival in the sleepy Umuosite village in Awba-Ofemili, Awka-North Local Government Area Anambra State as the traditional ruler, the Nze-na-Ozos and prominent stake holders turned up Thursday 23rd February 2017 to witness the handover of a house built by the Wife of the Governor, Chief (Mrs.) Ebelechukwu Obiano for an indigent widow in the community, reports NaijaAgroNet. The 2-Bedroom bungalow, according to Odogwublog.com, is the tenth house donated by the governor's wife under CAFE Housing for Indigent Widows, a programme of her NGO, Caring Family Enhancement Initiative (CAFE) which targets helpless widows who are in need of a roof over their heads in communities across the state. Addressing the excited crowd, Mrs. Obiano stated that her motivation for embarking on such selfless work is in fulfillment of her promise to God that she would provide succor to such helpless widows to ameliorate their plight. Said she: “I came to Awba Ofemili today to fulfill my duty to my God by handing the keys to this house to yet another indigent widow. I have never met the beneficiary before now, she was chosen based on the report and photos of her dilapidated house provided by a staff of CAFE and confirmed by the elders of the community." 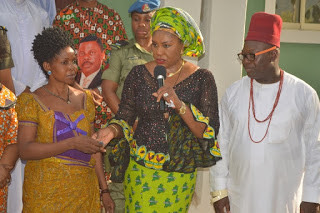 Mrs. Obiano further stated: "As I hand over the keys to Mrs Jacinta Ofonyelu, I wish to say that the house belongs to her and her children only. It is at her discretion to choose relations to allow into her house and should be allowed to live in peace without harassment." The governor’s wife urged the community to shun any practices that may tend to undermine the dignity of women but instead channel their energies towards helping the poor. She announced that the water borehole component of the project to be managed by a Community Woman Leader, Mrs. Jane Nweke would serve the beneficiary and the rest of the community. Welcoming the wife of the Governor, Head of Local Government Service, Awka North Local Government Area, Mr. Charles Chukwuma said with excitement that "we have not seen such before. For such a building to be built free for somebody. I can assure you that the beneficiary cannot forget Mrs. Obiano. You can see she is grateful as well as the members of the community." Mr. Chukwuma told the people to pray for the governor's wife and also pledged that the people of the area will continue to support the governor. Other Community leaders who spoke at the event including the traditional ruler of thecommunity, Igwe Ezekwesili Mmaduagwuna and the Chairman of Anambra State Housing Board Cooperation, Chief Godson Ezenagu represented by Chief Bertram Nweke pledged their total support for governor Obiano and the APGA government in Anambra State. In her Vote of thanks, the excited beneficiary, Mrs Jacinta Ofonyelu sang and danced in appreciation and thanked Mrs. Obiano for rescuing a helpless widow like her even without meeting her. 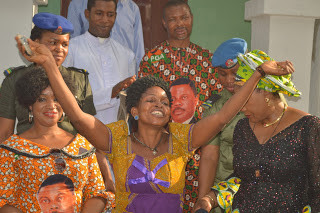 She also prayed to God to protect Mrs. Obiano and her husband the Governor. Pix 2(L-R): Cutting the Tape :Beneficiary, Mrs. Jacinta Ofonyelu, Wife of Deputy Governor, Mrs. Oby Okeke, Wife of the Governor of Anambra State, Chief Mrs. Ebelechukwu Obiano, Traditional ruler of the community, Igwe Ezekwesili Mmaduagwuna and Chief Bertram Nweke at the house commissioning in Awba Ofemili. Pix 3(L-R): Let there be water: Mother of Mrs. Obiano, Evang. Fidelia Nwanuka (JP), Commissioner for Social Welfare, Children and Women Affairs, Dr. Mrs. Victoria Chikwelu, Wife of Deputy Governor, Mrs. Oby Okeke, Wife of the Governor of Anambra State, Chief Mrs. Ebelechukwu Obiano, Traditional ruler of the community, Igwe Ezekwesili Mmaduagwuna and Chief Bertram Nweke at the commissioning of the water borehole in Awba Ofemili. 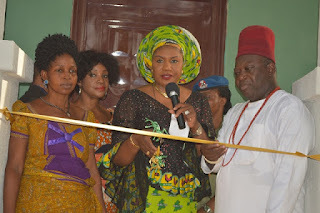 Pix4a&4b (L-R): Wife of the Governor of Anambra State, Chief Mrs. Ebelechukwu Obiano,(centre) handing-over keys of the new house to the beneficiary, Mrs. Jacinta Ofonyelu with the Traditional ruler of the community, Igwe Ezekwesili Maduagwuna at Awba Ofemili.